1.e4 e5 2.¤f3 ¤c6 3.¤c3 ¤f6 4.Ґb5. This is the initial position of the Four Knights Defense. It is reputed as quiet positional opening. However, we know that gambit ideas can be found in any opening. Later, in 1923 German master Wagner with the help of Teichmann concluded the effort of many famous players. That excellent analysis has not been revised since. However, it is time to return to the chess board. 5...Је7 6.f4. A simple 6.¤f3 only led to simplifications: 6...¤:b5 7.¤:b5 Јe4+ 8.Јe2 Ј:e2+ 9.ў:e2 ¤d5=. 6...¤:b5 7.¤:b5 d6 8.¤f3 Ј:e4+ 9.ўf2 ¤g4+ 10.ўg3. Less principled is 10.ўg1. Black can play 10...Јс6 with a good game. Those seeking adventures prefer 10...Јc4, which is more unclear, but also playable. 10...Јg6. Weaker is 10...ўd8, which was played in the aforementioned 3rd game of Bogolyubov-Rubinstein match. 11.¤h4. Anotheroptionis 11.Је2+. Spielman-Rubinstein (Baden Baden 1925) continued 11...ўd8 12.¦е1 Ґd7 13.¤bd4 ¤e3+ 14.ўf2 ¤:c2 with advantage to Black. 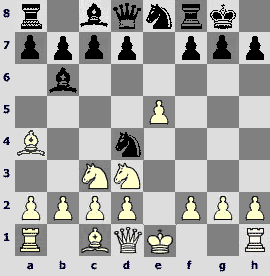 2) 16.Јg1 d5 17.d4 Ґd6+ 18.Ґf4 Јf6 19.Ґe5 ¦g8 with winning attack. A colorful position. Efim Bogolyubov had analyzed 14...¤е4+ 15.ўh2 Ј:h4 16.Јf3 d5 17.d3 with an edge to White, but Wagner showed an unexpected way of developing the attack. 14...Ј:h4+!! 15.ў:h4 ¤e4 16.Јg4. Forced; 16.Јh5 leads to the same position after 16...Ґе7+. A natural 16.g4 leads to a quick mate after 16...Ґе7+ 17.g5 h6. 16...Ґe7+ 17.Јg5 Ґ:g5+ 18.fg h6 19.g6 fg 20.¦f1. Theonlymove. After 20.d3 the White's king is a the mating net: 20...g5+ 21.ўh5 Ґf5. 20...g5+ 21.ўh5 ¤g3+ 22.ўg6 ¤:f1. 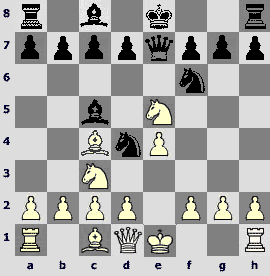 Wagner and Teichmann assessed this position in Black's favor, and it seems they were correct, although modern computer engines doubt such a categorical conclusion. In any case, the analysis after 23.ў:g7 ¦е8 24.g4 has to be continued. As you can see, this paradoxical gambit is full of adventures and interesting findings. Then it evolved in different ways. 1.е4 е5 2.¤f3 ¤c6 3.¤c3 ¤f6 4.Ґb5 ¤d4. 5.¤:d4 ed 6.e5 dc 6.ef. Now 6...cd+ 7.Ґ:d2 Ј:f6 istoorisky, asafter 9.0-0 Black can get under a devastating attack. There are many confirmations: 9...Ґе7 10. Ґс3 Јg5 11.¦е1 0-0 12.¦е5 Јf6 (12...f5 13.Ґc4+ ўh8 14.f4! Јf6 15.Је2) 13.Ґd3 g6 (13...h6 14.Јg4 Јh4 15.Ј:g7+! ў:g7 16.¦g5#, Posch-Derr, Vienna 1958) 14.Је2 Ґd6 15.¦h5 Јe6 16.¦:h7! winning, Milev-Fuderer (Amsterdam 1954). One may ask, why Black did not take the bishop by 11...Ј:b5? Here is a convincing reply: 12.Јg4 ¦g8 13.¦:e7+ ў:e7 14.Јe4+ ўd8 15.Јh4+ f6 16.Ґ:f6+ ўe8 17.¦е1+ ўf7 18.¦e7+ ўg6 19.Ґe5 d6 (19...Је2 20.¦:g7+ ¦:g7 21.Јf6+ ўh5 22.Јf5+ ¦g5 23.Ј:h7+ ўg4 24.h3#) 20.Јg3+ ўh5 21.Јf3+ ўh6 (21...Ґg4 22.Јf7+ g6 23.Ј:h7+ ўg5 24.h4+ ўf5 25.Јf7+ ўe4 26.f3+ ўe3 27.Ґf4+ ўd4 28.Ґe3#) 22.Јf4+ g5 23.Јf6+ ¦g6 24.¦:h7+! ў:h7 25.Јh8#. This daring attack occurred in Shipman-Weber (New York 1985). However, all these brilliancies is just a pleasant surprise in the kingdom of boredom that is reached after 6...Ј:f6 7.dc Је5+ 8.Је2 Ј:e2+. Even great Alekhine was unable to invent anything – the game ends in a draw almost invariably. However, not every line of the Rubinstein gambit is boring. We will examine two interesting continuations: 5.Ґc4 and 5.Ґа4. One has to admit that 5.Ґс4 looks very sensible, as now after ¤:e5 White will be attacking the Achilles' heel of Black's position, the f7-pawn, twice. Facing 5.Ґс4, Black can slow down the tempo and try to stabilize the situation by 5...¤:f3+, however, a true gambit players cannot resort to such a concession. Black can fight for the initiative in two ways: 1) 5...Ґc5 and 2) 5...c6. White has a wide choice, however, let's focus on a principled 6.¤:e5. This position was much-played a century ago by the gambit founder. 6...Је7! Black continued playing paradoxically. Now 7.Ґ:f7+ is unsatisfactory, as after a cool 7...ўd8 Whtie loses material. A natural 7.¤:f7 is also dangerous: 7...d5 (7...¦f8 is possible too) 8.¤:h8 dc 9.d3 Ґg4 10.f3 Ґh5 11.Ґg5 0-0-0, and Black has excellent prospects of converting his development lead into a strong attack. 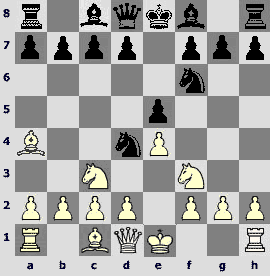 Thus it becomes clear that White has to retreat the knight: a) 7.¤f3; b) 7.¤d3. а) 7.¤f3 d5! 8.Ґ:d5. White can also take with the knight, which creates an independent branch: 8.¤:d5 Ј:e4+ 9.¤e3 Ґg4 10.Ґe2 ¤:e2 11.Ј:e2 0-0-0. The practice has shown that Black's compensation for a sacrificed pawn is sufficient. 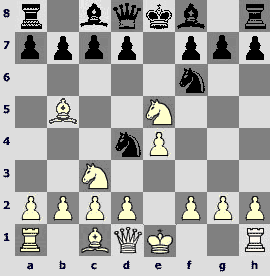 Black obtains a good game after 8.¤:d4 dc 9.¤f3 ¤:e4, which occurred in the game Spielman-Rubinstein (San Sebastian 1912). 8...Ґg4 9.d3 c6. It is possible that a brave 9...¤d7 will turn into a new main line. We'll examine it later. 10.Ґb3 ¤d7. A critical position. An old game of two grandees of the past Bernstein-Rubinstein, Vilno 1912, continued 11.Ґg5 Јd6. 92 years later Bulgarian grandmaster Delchev tried to improve the Black's play against Drabke (San Vincent 2004) – 11...¤:f3 12.gf Ј:g5 13.fg ¤e5 14.¤a4 Ґ:f2+ with perpetual. Some theoreticians rushed to announce that the thread is closed. However, in Motylev-Shirov (Bastia, 2004) we witnessed a brilliant novelty. 12.¤:d4!! A wonderful combination in Rudolf Spielman's style. 12...Ґ:d1 13.¤f5 Јf8 14.Ґ:c5 Ј:c5 15.d4 Јb4 16.¦:d1 ¤g6 17.¤:g7+ ўf8 18.¤f5. White has sufficient compensation for a sacrificed queen. You already know my advice: study the position after 9...¤d7 carefully. The difference in case of 10.Ґе3 ¤de5 11.¤:d4 Ґ:d1 is apparent: White's c2-pawn is not protected. This can be used in the variation 12.¤f5 Јf6 13.Ґ:c5 Ґ:c2. And after 12...Јf8 13.Ґ:c5 Ј:c5 14.d4 Јb4 15.¦:d1 Ј:b2 the b2-pawn falls. Also the line 10.Ґ:b7 ¤de5 11.¤:d4 (11.Ґ:a8 ¤d:f3+ 12.gf Јh4) 11...Ґ:d1 12.Ґ:a8 Ґ:d4 13.¤:d1 c6 fails to inspire White. 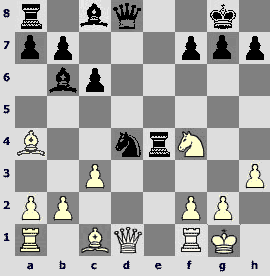 Now let us study another knight retreat – 7.¤d3. b) 7.¤d3 d5 8.¤:d5. In case of 8.Ґ:d5 Black obtains sufficient compensation for a sacrificed pawn: 8...¤:d5 9.¤:d5 Ј:e4+ 10.¤e3 Ґd6 11.0-0 Ґe6 12.¤e1 0-0-0 13.c3 ¤f5 14.Јc2 Јh4, Nimzovitch-Alekhine (Petersburg 1914). 8...Ј:e4+. 8...¤:d5 usually leads to a dull draw after 9.Ґ:d5 c6 10.¤:c5 cd 11.c3 Ј:c5 12.cd Ј:d4 13.ed 0-0 14.0-0 Ґf5. The time for reminiscences has come once again. Many books give a nice miniature Belitzman-Rubinstein (Warsaw 1917): 10.0-0 b5 11.Ґb3 Ґb7 12.¤e1 Јh4 13.g3 Јh3 14.c3 h5 15.cd h4 16.Је2 Ј:h2+! 17.ў:h2 hg++ 18.ўg1 ¦h1#. It looks like a picture from exhibition, and not a real chess game! However, we live in a cruel time. Turn the computer on, and see 16.¤f3! It is better not to look at the monitor after it: the computer is angry about Black's reckless play and is ready to humiliate human nature. But let us gather our courage and continue the analysis without paying attention to the machine recommendations: 17...Ґ:g3 18.Јe2 (18.Ґ:f7+ ўf8 19.Ґb3 Ґ:h2+ 20.ўf2 ¦е8, and not everything is grim for Black) 18...Ґ:f3 19.¦:f3 Ґ:h2+ 20.ўf2 Ґg3+ 21.¦:g3 ¤e4+ 22.ўe1 (only the wildest players can enter such a mess as 22.ўf3 Ј:g3+ 23.ўe4 Јg6+ 24.¤f5 ўf8) 22...Јg6 23.Ј:b5+ c6 24.Јe5+ ўf8. Maybe White stands better, but Black's activity is impressive. However, what could be done if Black has no intention of taking that much risk? A valid question. In this case, one should forget about defeating a naïve amateur in spectacular style, and play pragmatically: 12...0-0 13.d3 Јh4 14.g3 Јh3 with good compensation for a pawn. 10...Јh4+ 11.¤f2 0-0 12.c3 ¤f5 13.g3 Јg5. 13...¤:e3 14.gh ¤:d1 compensates for a pawn loss even after the queens are exchanged. 14.¤:f5 Ґ:f5 15.d4 ¦ае8+ 16.ўf1 Јg6.Black pieces' activity worth a pawn. Vrana – Kozak (Znoimo 2004). We shall make a small break here to get acquainted with another gambit thriller. Its author is a legendary hero of Soviet chess of the 70s, director of the Central Chess Club, head of the Chess department of mighty State Sports Committee, Victor Davydovich Baturinsky. He tried to emulate Winston Churchill: drunk cognac, smoked cigars, had a good sense of grim humor. He enjoyed terrorizing grandmasters, so we used to call him a "Dark Colonel". In addition, Colonel Baturinsky was devoted book collector and correspondence player. You have a chance to appreciate his skill now. 1.e4 e5 2.¤f3 ¤c6 3.¤c3 ¤f6 4.Ґb5 ¤d4 5.Ґc4 c6 6.¤:e5 d5 7.ed Ґd6 8.¤:f7. Let us be indulgent, there were neither Chess Informants nor databases in 1960. Correspondence players invented their moves in evenings after work. The moves were born in quiet cabinets or during a friendly feast, when every amateur wanted to look like Adolf Andersen. Weshalldiscussaprofessional8.¤f3 later. 8...ў:f7 9.dc+ ўf8 10.d3 Ґg4. Of course, prosaic 10...¤:c6 was stronger. The die is cast, and the opponents begin to approach each other for a point-blank fire. Looking through the game, it is difficult to believe that the players were in different countries and communicated by mail. 11.f3 Јe7+ 12.¤e4 ¤:e4 13.de Ґc5 14.cb ¦d8. A climax! The computer insists on 15.fg, which is also the most natural move in the position. Take a look at the trap Soviet military prosecutor prepared for the Western chess fan: 15.fg Ј:e4+ 16.ўf1 ўe8 17.Ґb5+ ўe7 18.Ґg5+ ўe6 19.Ґc4+ ўe5, and Black wins! Turn on the engine if you don't believe it: the computer confidently takes Black in the final position. 15.b8Ј¦:b8 16.c3. Stronger is 16.Ґе3, developing the pieces. 16...Јh4+ 17.ўd2 Јf2+ 18.ўd3 ¤c6. Black sets up a new trap. Objectively stronger is 18...¦d8 19.Ґd5 Ґc8 with dangerous initiative. On the contrary, a natural-looking 18...¤:f3 leads to a disaster: 19.gf Ґ:f3 20.¦f1. 19.Ґf4. There is no escaping fate. White avoided a crafty trap on the 15th move, but now falls into a simpler one. It was necessary to play 19.Је2, with a complicated game ahead. Now Black mates in two. 20...Јe3+! 21.Ґ:e3. Less spectacular is 21.ўс4 ¤а5#. 1.e4 e5 2.¤f3 ¤c6 3.¤c3 ¤c6 4.Ґb5 ¤d4 5.Ґc4 c6 6.¤:e5 d5 7.ed Ґd6 8.¤f3 ¤:f3+. Also possible is 8...Је7+ 9.ўf1 ¤:f3 10.Ј:f3 0-0 11.h3 ¦е8 12.g3 b5 13.Ґd3 b4 14.¤d1. This occurred in Kristol – S.Polgar (Israel 1999), and now, instead of 14...cd, 14...¤:d5 deserved attention, with good compensation for a pawn. 9.Ј:f3 0-0 10.h3 b5 11.Ґe2 b4 12.¤e4 ¤:e4 13.Ј:e4. Here Svidler played 13...cd. Ivanchuk in his usually brilliant comments discusses 13...¦е8, which seems to be even stronger. Here is the main line: 14.Јf3 cd 15.0-0 Је7 16.Је3 (16.Ґb5 Ґ:h3 17.Ґ:e8 ¦:e8 18.¦d1 Јe6 with advantage to Black) 16...Ґ:h3 17.gh Јh4 18.Јf3 ¦:e2 19.Ј:e2 Ј:h3 20.f3 Ґc5+ 21.d4 Ґ:d4+ 22.¦f2 Јg3+ 23.ўf1 Јh3+ with perpetual. A good piece of analysis. However, I got interested about the following sideline: 14...Ґa6 15.d3 cd 16.0-0 Јe7 17.Ґd1 Јe5 18.g3 ¦ас8 with compensation for a sacrificed pawn. Black's pieces developed an impressive activity. Therefore, there were people willing to test this recommendation. In Jones – Hebden (London 2004) White deviated, and it seems it was more due to lack of knowledge then home preparation: 16.Ґе3 Ґе5 17.d4 Ґ:e2 18.Ј:e2 Ґ:d4 19.0-0-0 Ґ:e3+ 20.fe with approximately even chances. In passing White avoided a danger zone, which started after a natural 17.0-0-0. HereBlackcanventure. Apart from normal 17...Ја5, one can try a drastic 17...Ґс3. In order to illustrate magical richness of the position, a curious line is given: 18.bc bc 19.¦de1 ¦b8 20.Јf4 Ја5 21.a3 (21.ўd1 ¦b4) 21...d4 22.Ґh5 de 23.Ґ:f7+ ўh8 24.Ґ:e8 Ј:a3+ 25.ўd1 Ґ:d3 26.cd ¦b2, and Black wins. 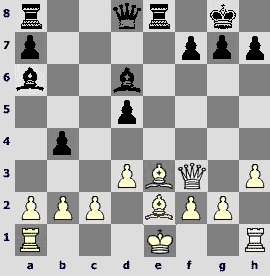 However, we will not stop on it and return to the position after White's 16th move. If White remains unimpressed enough and plays 17.0-0-0, Black has a crafty 17...Јс7 18.¦d2 Ја5 19.ўb1 d4! 20.Ґf4 (20.Ґ:d4 b3!) 20...Ґ:f4 21.Ј:f4 g5! 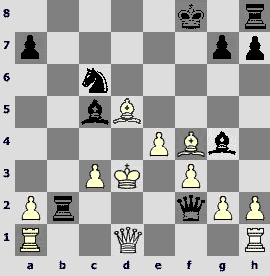 22.Јf6 (22.Ј:d4 b3) 22...¦е6 23.Ј:d4 b3!, and Black suddenly wins. My guess is this is how the first game in this variation will develop. Then White will try a more modest 17.0-0, but Black also has interesting tactical opportunities: 17...d4! 18.Ґ:d4 (18.Ґc1 ¦:c2 19.Ґd1 ¦c5 20.Ґa4 ¦e7 21.Ґd2 Ґb7 22.Јg4 ¦e6 with advantage) 18...Ґb8 19.Јg4 g6 20.Ґe3 h5 with strong initiative. The computer insists on advantage close to a winning one. 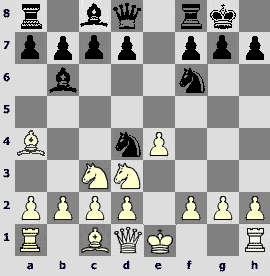 As we studied more of the Rubinsten Gambit, we can appreciate the White's last move. We already know, that Black's counterplay is often associated with the move d7-d5, therefore the move 5.Ґа4 is logical and popular. This is Mikhail Botvinnik's choice. 5...Ґс5 6.¤:e5. Less principled is 6.0-0, Black usually proceeds with 6...0-0. 6...0-0. A poor-spirited 6...Је7 allows regaining a pawn, but in this case White gets a positional advantage: 7.¤d3 ¤:e4 8.0-0 ¤:c3 9.dc ¤e6 10.¤:c5 Ј:c5 11.Ґe3, Botvinnik-Veresov (USSR 1940). 7.¤d3. Looks ugly on the first glance, however, White wins a precious tempo attacking the bishop. A natural 7.0-0 surprisingly leads to great problems after 7...d6. Now White has to choose, and, like in fairy tales, the choice offered is not too pleasing. а) 8.¤d3. After 8.¤с4 the game develops in similar fashion. 8...Ґg4 9.Је1 ¤f3+! 10.gf Ґ:f3 11.¤:c5. On 11.¤f4 there is 11...¤d5! 11...¤g4, and White has nothing better than 12.d3 Јh4 13.Ґf4 Јh3. I was curious to see how many games with this cute trap could be found in the database. I found three, but there is clearly some misunderstanding. During my lengthy chess career I was the position after the Black's 9th move dozens of times in tournaments of various strength. Dare, and let me assure you, you will not be waiting for too long. b) 8.¤f3 Ґg4 9.d3 Јс8. It is curious that this official theoretical suggestion is rarely met in practice. By the way, the theory ends on Јс8. 9...¤d7 also looks good, Lyublinsky-Lilienthal (Moscow 1945). Let us extend the analysis after 9...Јс8: 10.¤b5 (10.Ґf4 Ґ:f3 11.gf Јh3 12.Ґg3 h5) 10...Ґ:f3 11.gf Јh3 12.¤:d4 Ґ:d4 13.Јe2 Ґe5 14.f4 ¤g4 15.f3 Ґd4+ 16.ўh1 ¤:h2, and Black must win. This is just an analysis line yet to be supported by practical examples, but it is clear that White can't be satisfied with 7.0-0. However, another natural move 7.d3 is quite playable. Black has two ways of developing the counterplay: 7...d5 and 7...d6. 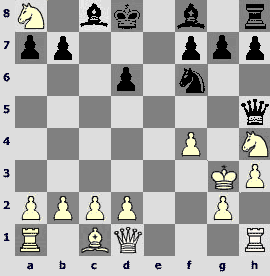 Although this position is known for a long time, it is hard to tell which White's move should be preferred. 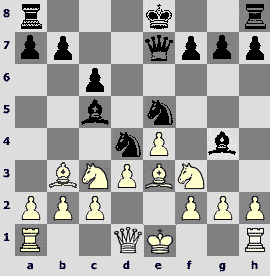 9.f4 isdangerous: 9...¤e6!, Frindt – Balogh (Slovakia 1993). White can't complete the development quietly after 9.h3 ¦е8 10.¤f3 because of a spectacular 10...¤:e4! with advantage to Black. Very interesting complications arise after 9.Ґh4. For a 5-o'clock tea break I can suggest the following stylish line: 9...¦е8 10.f4 Јb6 11.Ґ:f6 Ј:b2 12.¤:d5 cd 13.¦b1 Ј:a2 14.Ґ:e8 ¤:c2+ 15.ўe2 gf 16.Ґ:f7+ ўf8 17.Ґ:d5 ¤d4+ 18.ўf1 ¤b3!! 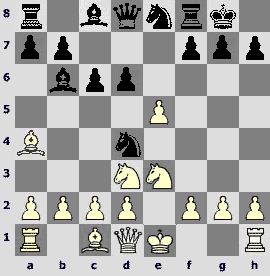 with very sharp game, in which Black's chances should be preferred. 9...¦е8 10.f4 b5 11.Ґb3 h6 12.Ґh4 ¤:e4 13.Ґ:d8 ¤:d2, and Black has a better endgame, Tarrasch-Rubinstein (San Sebastian 1912). Now we'll study 7...d6 and soon find out that this modest move is actually quite decent. 8.¤f3 Ґg4 9.Ґe3 c6 10.h3. Maybe one should have tried 10.Ґb3. 10...Ґ:f3 11.gf d5. 11...¤d7 deserves close attention, with rich play for a sacrificed pawn. 12.Ґg5 h6 13.Ґh4 Јd6. Natural 13...¦е8 is also good, for example, 14.0-0 b5 15.Ґb3 a5 16.a4 b4 17.¤b1 ¤:b3 18.cb Ґd4 19.Јс2 Јс7 with more than sufficient compensation for the material. 14.Ґg3 Је6 15.ўf1 ¦ad8. Black has a good game, Kamsky-I.Sokolov (Brussels 1992). 1.е4 е5 2.¤f3 ¤c6 3.¤c3 ¤f6 4.Ґb5 ¤d4 5.Ґа4 Ґс5 6.¤:е5 0-0. Let us return to 7.¤d3 and continue by 7...Ґb6. A position that is very important to assess the gambit from the modern theory point of view. White now has to make a critical choice, which will determine the course of the game. There are two main lines and one secondary line. The latter begins with 8.0-0. Black replies with, 8...d5, ofcourse. 9.¤:d5. Almost forced, as after 9.е5 Ґg4 10.Је1 ¤h5 White has no arguments against Black's growing attack (Јh4, Ґf3 etc.). 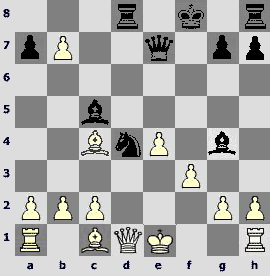 9.ed is not much of an improvement: 9...Ґg4 10.Је1 с6, and Black's initiative is strong. 9...¤:d5. Not bad is 9...¤:e4 10.¤c3 ¤f6, with good game for Black. For instance, 11.¤e5 c6 12.d3 ¦е8 13.Ґf4 Ґc7 14.¦е1 ¤d7! with excellent prospects. 10.ed Ј:d5. 10...Јh4 leads to a very sharp game. After 10...Ј:d5 it is very difficult for White to find a sensible developing plan. Anatural 11.¤f4 isunpleasantlymetby 11...Јg5. 11.¤е1 leads to a quick disaster after 11...Јс4 with a sample line 12.с3 ¤e2+ 13.ўh1 ¤g3+, and on 11.с3 Black has 11...Је4. White has to spend another tempo on 11.ўh1. This position is new to the theory, so it is too early for any definite conclusions. As we see, 8.0-0 does not pose a threat for Black. 1.е4 е5 2.¤f3 ¤c6 3.¤c3 ¤f6 4.Ґb5 ¤d4 5.Ґа4 Ґс5 6.¤:е5 0-0 7.¤d3 Ґb6. Now let's take a look at the main lines: 1) 8.¤f4 and 2) 8.e5. Here one can gamble and play 8...d5 straight away, without any preparation. Naturally, we are especially interested in accepting the sacrifice of a second pawn: 9.¤f:d5 ¤:d5 10.¤:d5 Јh4. An important moment! 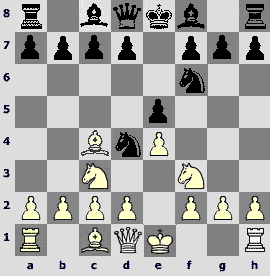 Some opening manuals including ECO continue this line as follows: 11.0-0 Ґg4 12.Је1 ¤f3+ 13.gf Ґ:f3, and Black wins. However, the conclusion is not that clear: 11.¤e3 f5 12.ef Ґ:f5 13.0-0 ¦f6 14.¤:f5 ¦:f5 15.Ґd7 (I can't see any other defense against Black's attack) 15...¤f3+ 16.gf ¦h5 17.h3 Јg3+ 18.ўh1 ¦:h3+ 19.Ґ:h3 Ј:h3+, and the game ends in a draw (Navara-Shirov, Prague 2004). If White does not take on d5, then after 9.d3 (instead of 9.¤f:d5) 9...c6 the game can return to the studied paths (8...c6 9.¤f4 d5). After 8...d5 9.d3 Ґg4 10.f3 ¤h5 11.¤:h5 (11.fg Јh4+ 12. g3 ¤:g3 13.¤g2 Јf6 14.hg ¤f3+ 15.ўe2 ¤d4+=) 11...Ґ:h5 12.¤:d5 c6 (12...Јh4+ 13.g3 ¤:f3+ 14.Ј:f3 Ґ:f3 15.gh Ґ:h1 16.ўe2 c6 17.¤f4 with advantage to White, Canal-Eliskases, Keczkemet 1933) 13.¤:b6 ab the game is very sharp, and I personally consider Black's play being too risky. 8...с6 9.d3 d5 10.h3. We have a very good instance to find out that the life of a Rubinstein Gambit devotee is full of surprises. 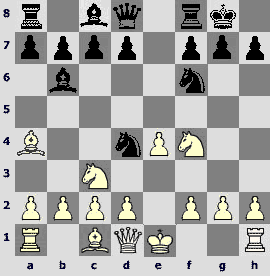 The Encyclopedia of Chess Openings (second edition) suggests 10.f3!? On the one hand, the authors (Paul Keres and Mark Taimanov) always were model professionals, on the other hand, what could be done about the following game Elis-Noetzel (Germany 2003) – 10.f3 ¦е8 11.¤ce2? de 12.de ¤:e4! 13.fе ¦:e4 (13...Јh4+!?) 14.с3 Јh4+ 15.g3 ¤f3+ 16.ўf1 Јh3+ 17.¤g2 ¤:h2+, and everything was over by the 23rd move. One can easily get lost in this labyrinth. Also many opening books give a strict warning: 10.0-0? Ґg4 "with a strong attack". Open the database and come across Vallejo-Almasi game (Tripoli 2004) – 10.0-0 Ґg4 11.Јd2 de 12.¤:e4 ¤:e4 13.de ¦е8 (the most interesting line 13...Јh4 14.h3 ¤f3+ 15.gf Јg3+ 16.¤g2 Ґ:h3 17.Јg5 Ј:f3 is waiting for its pioneers) 14.c3 ¤e2+ 15.¤:e2 Ј:d2 16.Ґ:d2 Ґ:e2 17.¦fe1 ¦:e4 18.Ґc2 ¦ee8. The endgame is totally equal. 10.Ґе3 also occurred. The critical position arises after natural moves 10...¤g4 11.Јd2. Now it is difficult for Black to resist the temptation of 11...¤:c2+ 12.Ґ:c2 d4, which occurred in practice a few times. However, an old recommendation of Yakov Estrin is by far the strongest: 11...de 12.¤:e4 ¤:e3 13.fe ¤f5. 10...¦е8 11.0-0 de 12.¤:e4 ¤:e4 13.de ¦:e4 14.с3. This position is usually considered equal. Indeed there were a few games in which an equal ending arose after 14...¤e6 15.Ј:d8. However, Black can struggle for advantage. 14...Ґс7 looks very interesting. It is difficult for White to make his next move. 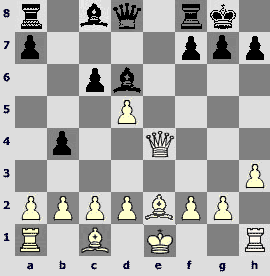 15.cd ¦:d4 drops a pawn. Even more dangerous for White is 15.f3 ¤:f3+! 16.gf Јg5+ 17.¤g2 Ґb6+ 18.ўh1 ¦h4! 19.¤:h4 Ј:h4 and even such materialist as Fritz gives Black an edge, Sarawanan-Ravi (Muzaffapur 1998). But even careful 15.Ґe3 does not guarantee full equality after 15...¤f5. 1.e4 e5 2.¤f3 ¤c6 3.¤c3 ¤f6 4.Ґb5 ¤d4 5.Ґa4 Ґc5 6.¤:e5 0-0 7.¤d3 Ґb6. Attention! We are in the eye of a heated opening debate. White has two main lines: a) 9. 0-0 and b) 9.¤d5. a) 9.0-0 d6 10.ed ¤f6. Black has a wide choice of interesting opportunities. Apart from 10...¤f6, there are often-played 10...¤:d6 and very rare 10...Ј:d6. Unfortunately, no clear recommendations are drawn, so we'll limit ourselves to a couple of examples. R.Birn – Shamkovich (Pasadena 1978): 10...¤:d6 11.¤e1 c6 12.d3 ¦е8 13.Ґf4 Јf6 14.Ґ:d6 Ј:d6 15.¤e4 Јg6 16.c3 Ґg4 with excellent play for a pawn. 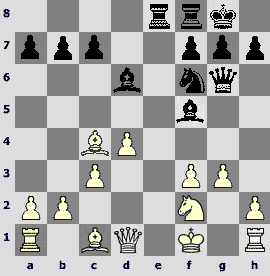 Nguen-Tkachiev (Moscow 2001): 11.¤f4 Јg5 12.d3 Ґg4 13.¤fd5 Јh5 14.Јd2 c6 15.Јf4 cd 16.Ј:d6 ¦ас8 with a sharp game. And now the only example from the computer database on 10...Ј:d6. Bauer-Durflinger (Germany 1988): 11.Јh5 ¤f6 12.Јh4 (12.Јe5 Јd8) 12...Ґf5 13.¤e1 Јb4! (with a crafty threat ¤е2+) 14.Јf4 Ј:a4 (very nice, but prosaic 14...Ґ:c2 15.¤:c2 ¤:c2 gives Black an advantage in the arising endgame) 15.Ј:f5 Јс6 (15...Ја6!? )16.Јh3 ¦fe8. Black has more than adequate compensation for a sacrificed pawn. Also you can always deviate from it according to your tastes – the position allows it. 11.d7. Looksforced. After 11.dc Ј:c7 Black is ready to start a direct attack against the king, while White has to think about development. 11...Ґ:d7 12.Ґ:d7 Ј:d7 13.¤e1 ¦ae8 14.d3. Let us take a look at complications that start with 14.¤f3. Present-day theory gives the following colorful line: 14...¤g4 15.h3 f5! 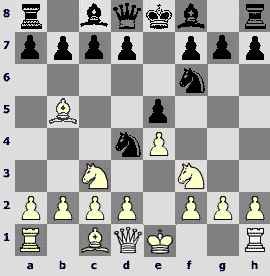 16.d3 (16.hg fg 17.¤g5 g3 with a powerful attack) 16...Јd6!? (the computer also suggests 16...¤:f3+ 17.Ј:f3 Ґ:f2+ 18.¦:f2 ¦е1+ 19.¦f1 Јd4+ 20.ўh1 ¤f2+ with a draw by perpetual) 17.hg ¤:f3+ 18.Ј:f3 fg 19.Јd5+ Ј:d5 20.¤:d5 Ґ:f2+. Here you can find a game Ruefenhart-Schebeniuk (corr., 1984), which continued 21.ўh1 ¦e5 22.¤f4 Ґg3 23.Ґd2 ¦ef5, and Black is better. However, an ending after 21.¦:f2 ¦е1+ 22.ўh2 ¦:f2 23.Ґe3 has yet to be tested. 14...¤g4 15.¤f3. White has to be very careful. A light-hearted 15.h3 is crushed by 15...¤:f2! 16.¦:f2 ¦:e1+ etc. 15...¤:f3+ 16.Ј:f3 ¤:f2 17.¤d5 ¤:d3+. For those who like brilliant finishes I will suggest the following nice-looking perpetual: 17...Ј:d5 18.Ј:d5 ¤h3++ 19.ўh1 ¤f2+. Two games of Ludek Pachman ended in this way, one game with White and one with Black. Probably Pachman liked the queen sacrifice too much. 1.e4 e5 2.¤f3 ¤c6 3.¤c3 ¤f6 4.Ґb5 ¤d4 5.Ґa4 Ґc5 6.¤:e5 0-0 7.¤d3 Ґb6 8.e5 ¤e8. b) 9.¤d5 d6 10.¤e3. A timely return. After 10.с3 Black seizes the initiative by 10...Јh4 11.¤e3 Јe4. Most people prefer 10...de, and 10...с5 is less popular. I have to answer a direct question why. So, thevariation 10...de 11.¤:e5 Јg5. 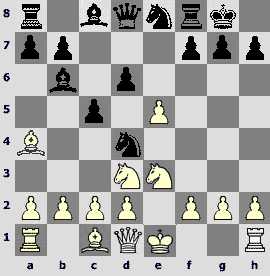 Single out Nunn-Nikolic (Wijk aan Zee 1993): 12.¤5c4 f5 13.f4 Ј:f4 14.c3 ¤e6 15.d4 Јh4+ 16.g3 Јh3 17.Ґb3 ўh8 18.¤:b6 ab 19.Ґd5! with advantage to White. So far the popularity of 10...de is hard to explain. Then 14...Јh4+ 15.g3 Јh3 became subject to a discussion. Movsesian-Illescas (Elista 1998) is considered a model game: 16.cd f4 17.¦f1 fe 18.¦:f8+ ў:f8 19.Јf3+ ¤f6 20.de Ј:h2 21.Јf2 Јh1+ 22.Јf1 Јh2 23.Јf2 Јh5 with a very sharp game. More than a decade has passed, and a turning point of the history of the whole opening has come. Young Russian grandmaster Alexander Motylev prepared some new interesting ideas in the Rubinstein gambit specially for the World championship in Moscow (2001). Two games are important for our discussion: Motylev-Shirov (4): 13.h4! Јg6 14.¤e5 Јf6 15.f4 ¤c6, and now, instead of 16.d4, which is also not bad, White, according to Motylev, obtain a big advantage by playing 16.Ґ:c6 bc 17.d4 ¤d6 18.c4 ¤d6 19.b4. Same people, game 6: 13...Јf6 14.f4 ¤d6 15.c3 ¤:c4 16.¤:c4 Јg6 17.ўf1 Ґe6 (too risky, but also after correct 17...¤с6 18.d4 Ґe6 19.d5 ¦ad8 20.¤:b6 ab 21.c4 White has an edge) 18.¤e5 Јg3 19.cd Ґd5 20.Јe2 Ј:f4+ 21.¤f3. The attack has evaporated, and huge material advantage promises White good future. So, a popular continuation 10...de requires a major repair. However, Black has an interesting sideline, starting with a logical move 10...с6. White's main line looks standard: 11.с3 ¤f5 12. 0-0 (12.Ґс2 yields nothing – Black can just play 12...¤:e3 13.de de, and 14.¤:e5 is dangerous in view of 14...Јg5) 12...Ґc7 13.f4 ¤:e3 (13...f6 leads to a very complex game, Anand-Ivanchuk, Monaco 1995) 14.de Ґf5 (weaker is 14...de 15.¤:e5; the alternatives are 1) 15...Ґf5 16.Ґc2 Ј:d1 17.Ґ:d1 ¤f6 18.¤g6, draw, Najer-Onischuk, Moscow 2002, however, the White's play can be improved – 16.е4! ?, and Black cannot play 16...Ґ:e4 in view of 17.¤d7; 2) 15...Јe7 16.Ґс2 ¤f6 17.e4 ¦е8 18.Јf3 Ґ:e5 19.fe Ј:e5 20.Ґf4 with an edge – given by English GM Danny King) 15.ed ¤:d6 16.¤e5 ¤e4 17.Ј:d8 ¦a:d8 18.g4 Ґ:e5 (18...Ґe6!? )19.gf Ґc7. Black has an adequate compensation for a pawn. 1.е4 е5 2.¤f3 ¤c6 3.¤c3 ¤f6 4.Ґb5 ¤d4 5.Ґа4 Ґс5 6.¤:е5 0-0 7.¤d3 Ґb6 8.e5 ¤e8 9.¤d5 d6 10.¤e3 с5. 11.c3 ¤f5 12.ed. Quieter is 12.Ґс2, after which Black regains a pawn with equal game: 12...¤:e3 13.de c4 14.¤b4 de 15.Јh5 (15.¤d5 ¤f6 16.¤:b6 Ј:b6 17.e4 Ґg4 18.f3 Ґe6=). Here in Shirov-Lautier (Linares 1995) Black reacted not in the best way – 15...f5 – and faced serious difficulties. Instead he could obtain a good game by 15...е4. 12.Ґb3 hasn't been tested seriously. Khalifman gives the following line: 12...de 13.¤:e5 Јe7 (13...¤:e3!?) 14.¤5c4 15.d3 Ґc7 16.0-0 b5 with complex play.